Sightings of celebrities acting stupidly are really not everyday occurrences, unless you happen to live in Southern California and be a stuper (short for a phenomenally stupid person)-magnet, like myself. When we think of idiot celebs, we generally gravitate towards the same old name. You know who I’m talking about: on the youngish side, blond, most unfortunately female, leaves thimble size dog with pet-sitter, then forgets after thirty seconds and reports the dog missing, and finally, can’t remember the name of the city hosting the Eiffel Tower although her own name is Paris. On my last trip to Los Angeles, my stupid celebrity sighting was a little bit more of a surprise. Maybe. I’m waiting on the corner with Son #2, about to take both our lives in our hands to cross Wilshire freaking Blvd. Even though there’s a signal and a crosswalk, motorists get really peeved with peds who take both the green okay-to-start-walking light and the crosswalk seriously. When the light turns green and we dare to cross, inevitably we are honked at 300 times by drivers itching to make a turn with only our bodies blocking their way. Son looks clueless, as Mr. Hoffman, being a somewhat elderly gent in Son’s eyes, has never before been seen by Son. We watch Dustin nearly get run over from his jay-walking stint. Then he waits directly across from us for the light to change while I continue to admire his luxurious silver locks. The light barely turns green before Dustin steps onto the treacherous, action packed Wilshire Blvd., and just as quickly as he steps into the crosswalk, Dustin maneuvers out of it and onto the path of cars making a left turn. He is honked at and flipped off and nearly hit before he hastily performs a little jig back into the safety of the crosswalk. Ever the entertainer. Son is amused. I eyed Dustin as we passed, giving him the once over. Pupils appeared normal; lips not excessively dry; eyebrows only subtly plucked; complexion really enviable; jeans and light blue, long sleeved shirt match nicely; no overt signs of drug induced insanity. I think maybe he’s a native New Yorker, possessing the dominant gene directing him to disregard traffic laws, but then I remember that like the Western Sycamore, he’s a So Cal native. The only explanation left was stupidity, and the inane desire of some celebs to be seen and/or heard at all costs. I threw a glance back at him as we parted; he waited for a car to turn into an alley while fluffing his gorgeous hair. Appropriate, don’t you think? This entry was posted on Tuesday, June 2nd, 2009 at 11:22 pm and is filed under Plain Old Fashioned Stupidity. You can follow any responses to this entry through the RSS 2.0 feed. You can leave a response, or trackback from your own site. There are a lot of actors I consider stupid. Hoffman wasn’t one of them, except when he goes political. Acting does not automatically make you an authority on world affair or politics, but how could stupers possibly know that? 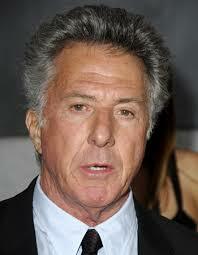 I was never a huge fan of Dustin hoffman. Now I see he’s overrated and a stuper. Do you remember that comment Olivier made about him in that movie they did together? Olivier said if Hoffman learned how to act, he wouldn’t have to hang out with the homeless or something like that! “special.” They think they can do anything they want and it cannot be wrong. It is our fault, because we make them feel this way. If you notice, at the supermarket or in the street, they want you to notice them. I noticed they usually don’t wear sunglasses and really want to be seen. What…..stupers. I swear I always suspected Dustin Hoffman was a stuper. Now I know for sure!